This morning I was dead-heading my knockout roses, a task that I actually enjoy as it gives me a chance to get out in nature instead of sitting in front of a computer all day. Just as I was reaching into the interior of one of my bushes to clip some old dead blooms, I spotted this beauty just hanging in its web right in front of my hand. It’s an orb weaver spider, non-aggressive and not dangerous to humans, but I didn’t know that at the time. I may have uttered an expletive at that point….I really don’t remember. 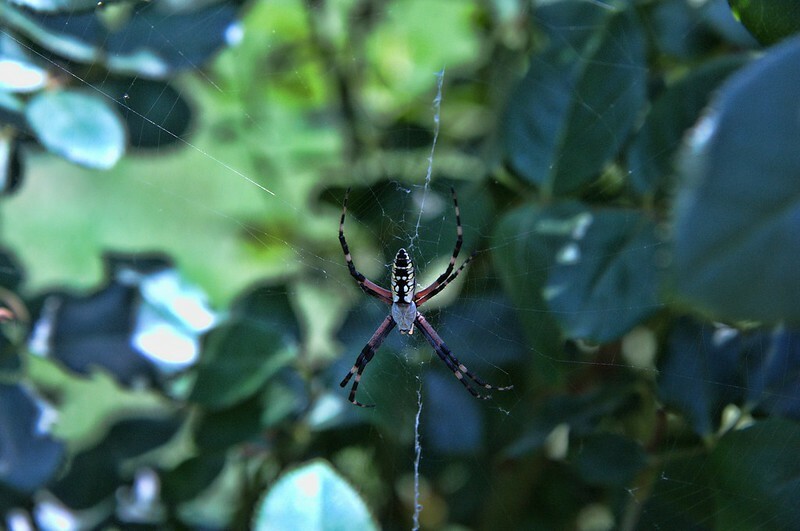 But after I caught my breath, I was just kind of blown away by the beauty of this creature, hanging in its web in the middle of my rose bush. I had my iPhone in my back pocket, so I tried taking a couple of shots with it, but couldn’t get it to focus correctly in the low light. So I finished up my yard work and then retrieved my Nikon D700 with my 28-300 Nikkor lens and went back to see if the spider was still there. Thankfully, it was right where I had left it (him? her? ), and I was able to get a few good shots with some great depth of field. I had the ISO bumped up to 2500 so I could get a faster shutter speed since there was a slight breeze blowing the web back and forth, and with the narrow depth of field I wanted to make sure I stayed in focus. I processed this in Paintshop Photo Pro V5 with Topaz Adjust. This entry was posted in Shooting and tagged D700, garden, nature, Nikon, orb weaver, Paintshop Pro, roses, spider, Topaz. Bookmark the permalink.